La Plata Judge Ernesto Kreplak summons journalist Hugo Alconada Mon to testify over allegations made in a recent investigation. A court in La Plata took testimony on Tuesday from investigative reporter Hugo Alconada Mon, who ratified some of the major allegations he made in a recent book about the Macri government's campaign financing tactics in the lead up to the 2015 general election and 2017 mid-terms. 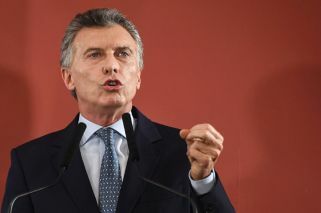 Then candidate for the president Mauricio "Macri met with big businessmen, one by one, in private encounters, and with other businessmen in groups of 25 people. Macri asked all of them for one percent of their capital and, to their surprise, he argued that the remaining 99 percent would be worth more with him as president", Alconada Mon wrote in "The Root of All Evil" (La raíz de todos los males), the most recent book by La Nación newspaper's star reporter. On Tuesday, Alconada Mon ratified his claims in statements given to La Plata judge Ernesto Kreplak. He refused to give up the identities of his sources, citing journalistic privilege, Perfil.com reported. Kreplak is investigating the so-called "fake donor" scandal, which centres on claims Macri's Cambiemos (Let’s Change) coalition laundered money by falsifying donation receipts using the personal details of low-income welfare recipients. One of the claimants, Noemí Viera, requested Alconada Mon's testimony. Viera alleges her identity was used to fake a donation to the Cambiemos campaign. She lives in Villa Itatí with her five children, and receives a welfare plan. In June, federal prosecutor Carlos Stornelli requested the auditing of campaign finances and an investigation into the structure of the campaign’s accounting and financial teams, following media reports of identity theft.